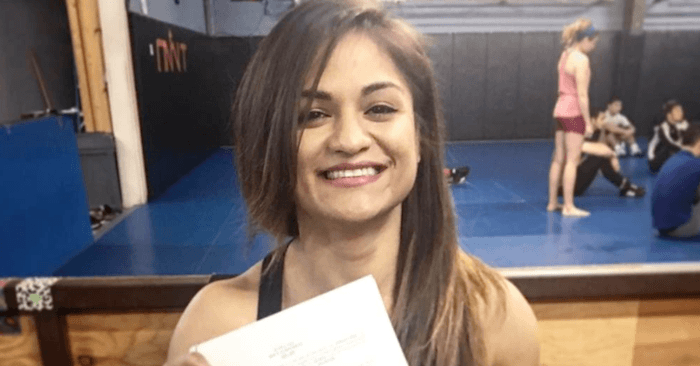 Team Alpha Male’s Cynthia Calvillo has signed a deal with the UFC. HUGE ANNOUNCEMENT!! You're looking at your newly signed @UFC strawweight fighter!!! I still can't believe it. I had so many setbacks before making my professional debut. it almost felt like I should've just gave up but I kept fighting through it all. And now 6months after my professional debut and racking up a 3-0 record I'm signed with the biggest MMA Promotion in the world! Dreams do come true… you just gotta work hard and have faith!! Big thanks to all my friends, family, sponsors and of course the best team in the world @teamalphamalemma I sincerely mean it, I couldn't do this without y'all!!! ❤️❤️❤️ #JustGettingStarted #teamalphamaleVSeverybody #FightNewsComingSoon! ? Calvillo announced her signing with the UFC on her Instagram on Thursday. Her UFC deal comes just six months after she made her professional MMA debut. Calvillo is one of the top prospects in the women’s strawweight division. She is undefeated with three wins. Two of her wins came by knockout or TKO. Calvillo also has an amateur win over undefeated Invicta fighter Aspen Ladd, who has won four fights in Invicta. Strawweight contender Paige VanZant is a training partner of Calvillo, who now joins other TAM fighters such as Hector Sandoval, Teruto Ishihara, Josh Emmett, Darren Elkins, Andre Fili, and UFC Bantamweight Champion Cody Garbrandt in the UFC.